A disease once spoken about in hushed tones and whispers—library voices, if you will—in the early 1980s became the centerpiece of a groundbreaking outreach effort at the National Library of Medicine in 1994. As the Library announces this year’s funded projects, we look at how NLM’s AIDS Community Information Outreach Program (ACIOP) has improved information access for the HIV/AIDS community and how the AIDS information landscape has changed during the program’s lifespan. The story of the AIDS virus began on June 5, 1981, when the US Centers for Disease Control and Prevention (CDC) published a report describing cases of a rare lung infection in five young, previously healthy, gay men in Los Angeles. All had other unusual infections as well, indicating their immune systems were not working; two had already died by the time the report was published. By year’s end, there was a total of 270 reported cases of severe immune deficiency among gay men, and 121 of those individuals had died. That same month, Congress allocated $5 million to the CDC for surveillance and $10 million to the National Institutes of Health for AIDS research. Even as understanding of the AIDS virus grew, its toll was increasingly bleak. In 1992, AIDS became the number one cause of death for US men ages 25 to 44. 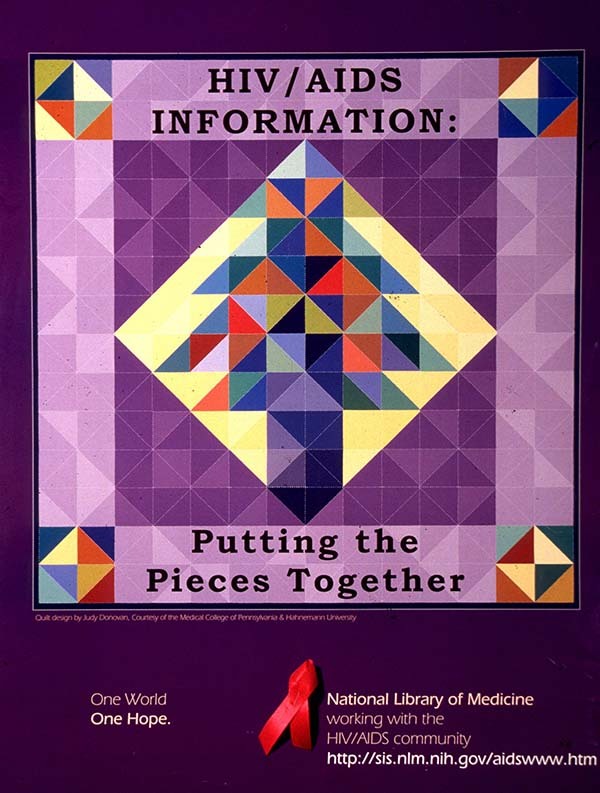 In 1994, under Dutcher’s guidance, NLM issued a request for proposals to fund AIDS community information outreach projects. Among other things, it would support equipment like personal computers, plus connectivity, training, and access to printed materials, such as journals and books. Out of an interesting collection of proposals, which included puppet shows and theater pieces, the National Library of Medicine funded its inaugural class of AIDS Community Information Outreach Projects, 19 in all, in 1994. Awardees included community-based organizations, public libraries, health science libraries, health care organizations, academic institutions, and correctional facilities. Since those early days, the NLM Specialized Information Services Division has done qualitative analysis of the program and its impact. Because most community organizations have the expertise needed to provide access and information in meaningful (and trusted) ways, having them involved has been very key. And HIV/AIDS information access has been improved via the organizations funded through this program. In addition, interdisciplinary partnerships encourage sustainability of projects, expansion of and to HIV/AIDS resources, and skill sharing among groups, which can in turn lead to developing new and improved outreach methods. NLM research shows there is a continuing need for funding and training of community organizations, so they can meet the needs of their clients and those in the HIV/AIDS community. On September 27, 2016, NLM announced funding for eight HIV/AIDS Community Information Outreach Projects. This program provides support to design local programs for improving information access for HIV/AIDS patients and the affected community, as well as their caregivers. The projects are funded for one year. This project is designed to increase the knowledge of HIV/AIDS by using social media to connect Black and Hispanic women to NLM online resources and to testing services offered by a local health clinic. The goal of this project is to bolster accessibility of HIV/AIDS-related health information and resources among the Latino population of Salt Lake County through training and social media and in-person outreach. An interactive e-learning and assessment module will cover such topics as HIV/AIDS, HIV prevention, HIV treatment, opportunistic infections, and HIV and specific populations. This project will create and post to a dedicated website four online, interactive Spanish-language educational modules. Project CHOICE will develop iBooks that provide culturally relevant, interactive health information and innovative access to NLM resources to meet the health information needs of African-American young adults related to HIV/AIDS. This project will use NLM resources to create an HIV/AIDS health information curriculum for the participants in a Chicago State University STEP UP healthcare pathways program targeting low-income African-Americans. YI Advisors will partner with The Grassroot Project to develop and implement an interactive social media campaign that provides the latest information from NLM resources on the HIV/AIDS epidemic to a wide audience. This project is a user-centered, design-based mobile application to reduce health disparities faced by transgender youth and young adults, 16-28 years old. October 18, 2016 in Programs & Services.